The first book to use the unexpected discoveries of neuroscience to help us make the best decisions. Since Plato, philosophers have described the decision-making process as either rational or emotional: we carefully deliberate, or we blink and go with our gut. But as scientists break open the mind's black box with the latest tools of neuroscience, they re discovering that this is not how the mind works. Our best decisions are a finely tuned blend of both feeling and reason and the precise mix depends on the situation. When buying a house, for example, it s best to let our unconscious mull over the many variables. But when we re picking a stock, intuition often leads us astray. The trick is to determine when to use the different parts of the brain, and to do this, we need to think harder (and smarter) about how we think. Jonah Lehrer arms us with the tools we need, drawing on cutting-edge research as well as the real-world experiences of a wide range of deciders from airplane pilots and hedge fund investors to serial killers and poker players. Lehrer shows how people are taking advantage of the new science to make better television shows, win more football games, and improve military intelligence. His goal is to answer two questions that are of interest to just about anyone, from CEOs to firefighters: How does the human mind make decisions? And how can we make those decisions better? Jonah Lehrer is editor at large for Seed magazine and the author of Proust Was a Neuroscientist (2007) and How We Decide (February 2009). A graduate of Columbia University and a Rhodes Scholar, Lehrer has worked in the lab of Nobel Prize winning neuroscientist Eric Kandel and has written for the New Yorker, Wired, Boston Globe, Washington Post, and Nature, and writes a highly regarded blog, The Frontal Cortex. Lehrer also commentates for NPR s Radio Lab. intead of praising kids for trying hard, teachers typically praise them for their innate intelligence (being smart). this type of encouragement actually backfires ,since it leads students to see mistakes as sighs of stupidity and not as the building blocks of knowlege. the regrettable outcome is that kids never learn how to lean. The only way to counteract the bias for certainty is to encourage some inner dissonance. We must force ourselves to think about the information we don't want to think about, to pay attention to the data that disturbs our entrenched beliefs. take the time to listen to what all the different brain areas have to say. We often make decisions on issues that are exceedingly complicated. In these situations, it's probably a mistake to consciously reflect on all the options, as this inundates the prefrontal cortex with too much data. "The moral of this research is clear," Dijksterhuis says. "Use your conscious mind to acquire all the information you need for making a decision. But don't try to analyze the information with your conscious mind. Instead, go on holiday while your unconscious mind digests it. Whatever your intuition then tells you is almost certainly going to be the best choice." We've seen how the different brain systems—the Platonic driver and his emotional horses—should be used in different situations. While reason and feeling are both essential tools, each is best suited for specific tasks. If the emotional brain is a fancy laptop, stuffed full of microprocessors operating in parallel, the rational brain is an old-fashioned calculator. cards. The only way to defend against such innate flaws is to exercise reason, to fact-check feelings with a little arithmetic. If the problem really is unprecedented—if it's like a complete hydraulic failure in a Boeing 737—then emotions can't save you. The only way out of a unique mess is to come up with a creative solution. However, this doesn't mean that our emotional state is irrelevant.Mark Jung-Beeman, the scientist who studies the neuroscience of insight, has shown that people in good moods are significantly better at solving hard problems that require insight than people who are cranky and depressed. discover that your beliefs rest on a rather shaky foundation. Second, continually remind yourself of what you don't know. YOU KNOW MORE THAN YOU KNOW. The emotional brain is especially useful at helping us make hard decisions. Its massive computational power—its ability to process millions of bits of data in parallel—ensures that you can analyze all the relevant information when assessing alternatives. The reason these emotions are so intelligent is that they've managed to turn mistakes into educational events. You are constantly benefiting from experience, even if you're not consciously aware of the benefits. The brain always learns the same way, accumulating wisdom through error. But once you've developed expertise in a particular area—once you've made the requisite mistakes—it's important to trust your emotions when making decisions in that domain. It is feelings, after all, and not the prefrontal cortex, that capture the wisdom of experience. If you're going to take only one idea away from this book, take this one: Whenever you make adecision, be aware of the kind of decision you are making and the kind of thought process it requires. The mind is full of flaws, but they can be outsmarted. 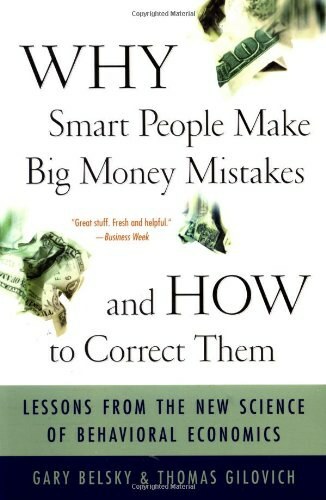 Of course, even the most attentive and self-aware minds will still make mistakes. They think about what they could have done differently so that the next time their neurons will know what to do. This is the most astonishing thing about the human brain: it can always improve itself. Tomorrow, we can make better decisions. that you try to tune out your feelings. Pilots call such a state "deliberate calm," because staying calm in high-pressure situations requires conscious effort. When you overthink at the wrong moment, you cut yourself off from the wisdom of your emotions, which are much better at assessing actual preferences. You lose the ability to know what you really want. The prefrontal cortex isn't good at picking out jams or energy drinks or bottles of wine. Such decisions are like a golf swing: they are best done with the emotional brain, which generates its verdict automatically. If the mind were an infinitely powerful organ, a limitless supercomputer without constraints, then rational analysis would always be the ideal decision-making strategy. The biological reality of the brain, however, is that it's severely bounded, a machine subject to all sorts of shortcomings. the conscious brain can only handle about seven pieces of data at any one moment. Like choosing a jam in the supermarket—can overwhelm the prefrontal cortex. It gets intimidated by all the jam data. And that's when bad decisions are made. tired: the brain is less able to suppress the negative emotions sparked by small annoyances. A bad mood is really just a rundown prefrontal cortex. time, it's constantly trying to "chunk" stuff together, to make the complexity of life a little more manageable. This is a counterintuitive idea. When making decisions, people almost always assume that more information is better. decision based on the facts that seem important, that person is asking for trouble. We all need to know about the innate frailties of the prefrontal cortex so that we don't undermine our decisions. This is known as the anchoring effect, since a meaningless anchor—in this case, a random number—can have a strong impact on subsequent decisions. The anchoring effect is about the brain's spectacular inability to dismiss irrelevant information. How we decide should depend on what we are deciding. It's only at this point—after the emotions have already made the moral decision—that those rational circuits in the prefrontal cortex are activated. People come up with persuasive reasons to justify their moral intuition. At its core, moral decision-making is about sympathy. We abhor violence because we know violence hurts. We treat others fairly because we know what it feels like to be treated unfairly. We reject suffering because we can imagine what it's like to suffer. whenever you see someone scowl, grimace, or cry. They [mirror neurons] allow us to grasp the minds of others not through conceptual reasoning but through direct simulation; by feeling, not by thinking." But there's another way that the developing brain can be permanently damaged: child abuse. When children are molested or neglected or unloved as children, their emotional brains are warped. What these abused children were missing was an education in feeling. They were simply missing the patterns of brain activity that normally guide our moral decisions. As a result, they reacted to the toddler in distress just as their abusive parents reacted to their own distress: with threats and violence. emotions are a crucial part of the decision-making process. When we are cut off from our feelings, the most banal decisions became impossible. A brain that can't feel can't make up its mind. The process of thinking requires feeling, for feelings are what let us understand all the information that we can't directly comprehend. Reason without emotion is impotent. According to James, the mind contained two distinct thinking systems, one that was rational and deliberate and another that was quick, effortless, and emotional. The key to making decisions, James said, was knowing when to rely on which system. "It's not the quantity of practice, it's the quality," he says. According to Robertie, the most effective way to get better is to focus on your mistakes. In other words, you need to consciously consider the errors being internalized by your dopamine neurons. he insists on searching for his errors, dissecting those decisions that could have been a little bit better. He knows that self-criticism is the secret to self-improvement; negative feedback is the best kind. Mistakes aren't things to be discouraged. On the contrary, they should be cultivated and carefully investigated. one of the crucial ingredients of successful education is the ability to learn from mistakes. Unless you experience the unpleasant symptoms of being wrong, your brain will never revise its models. Before your neurons can succeed, they must repeatedly fail. There are no shortcuts for this painstaking process. the expert naturally depends on the emotions generated by his dopamine neurons. His prediction errors have been translated into useful knowledge, which allows him to tap into a set of accurate feelings he can't begin to explain. the only way to get it right the next time is to study what he got wrong this time. Loss aversion is an innate flaw. Everyone who experiences emotion is vulnerable to its effects. The problem with credit cards is that they take advantage of a dangerous flaw built into the brain. This failing is rooted in our emotions, which tend to overvalue immediate gains (like a new pair of shoes) at the cost of future expenses (high interest rates). The evolution of the human brain changed everything. For the first time, there was an animal that could think about how it thought. We humans could contemplate our emotions and use words to dissect the world, parsing reality into neat chains of causation. We could accumulate knowledge and logically analyze problems. We could tell elaborate lies and make plans for the future. Sometimes, we could even follow our plans. The brain is designed to amplify the shock of these mistaken predictions. Whenever it experiences something unexpected —like a radar blip that doesn't fit the usual pattern, or a drop of juice that doesn't arrive—the cortex immediately takes notice. WE CAN NOW begin to understand the surprising wisdom of our emotions. The activity of our dopamine neurons demonstrates that feelings aren't simply reflections of hard-wired animal instincts. Those wild horses aren't acting on a whim. Instead, human emotions are rooted in the predictions of highly flexible brain cells, which are constantly adjusting their connections to reflect reality. Every time you make a mistake or encounter something new, your brain cells are busy changing themselves. Our emotions are deeply empirical. The madman is the man who has lost everything except his reason!